A common complaint of DC Universe Classics was about its over-reliance on oddball, C and D-list characters that most of the general public hadn’t heard of, and the subsequent delaying of heavy hitter characters until too far into the line’s run. Case in point: the Joker. Batman’s greatest foe, and we had to wait more than a year to get him (made especially egregious by Harley Quinn’s presence in Series freaking 2). Obviously, in a line like this, you want to hold some heavy hitters back, but 10 series seems like a bit much. But, with the line wrapped and gone, at least he got a figure. I’ll be looking at that figure today. 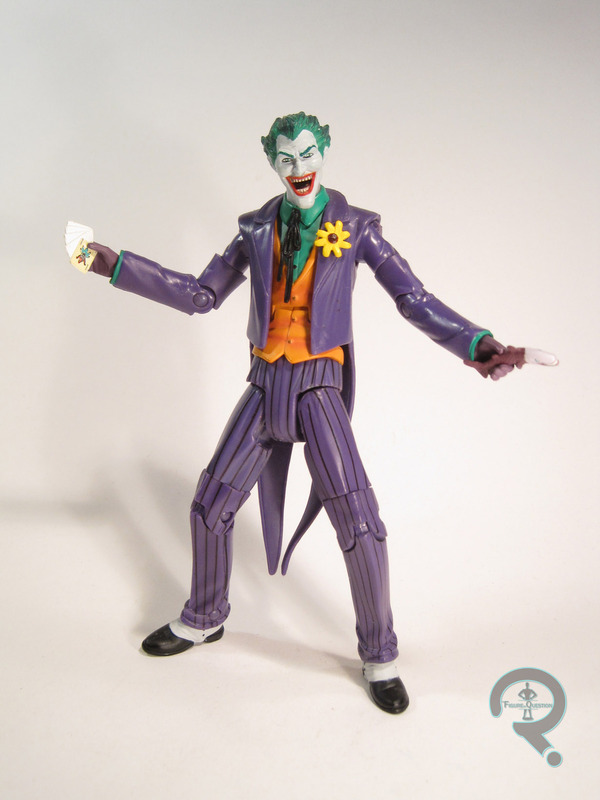 Joker was released in Series 10 of DC Universe Classics. I’ve been reviewing a lot of this particular series lately. Not for any particular reason, or anything; just luck of the draw I suppose. As I’ve noted in prior reviews, the series was the line’s second Walmart-exclusive series. While it was far less scarce than the first, it still seems a little odd that DC’s most recognizable villain was relegated to a store-exclusive release. There’s a reason this guy has one of the heftier aftermarket prices in the line. Anyway, the figure stands about 6 1/2 inches tall and he has 23 points of articulation. Joker is seen here in an appearance that’s about as classic as he can get (specifically, he’s modeled after his Super Powers figure as this was really when the line was leaning hard into the recreation of Super Powers). He’s built on the body that was introduced with Gentleman Ghost, which was designed with Joker in mind. In that effect, the cut of the suit matches up pretty well with classic depictions of Joker. The body showcases a lot of Mattel’s troubles with working articulation into a sculpt naturally. It’s nowhere near as bad as some of their more recent work, but it’s definitely not the strongest showing from DCUC. On the plus side, it’s not awful to look at, especially if you chose a decent pose. He had a unique head and neck, which are definitely the star pieces of this figure. He also has a tweaked jacket, which removes the cape from Gentleman Ghost and adds a flower to his lapel. It’s an okay piece, but slightly marred by the weird panel in the back where the cape was originally attached. Why does Mattel insist on attaching capes with that huge rectangular peg? I don’t think I’ll ever know. The paint work on the figure’s actually pretty good. The colors are nice and bold, and there’s some really well-executed accenting, especially on the hair and the vest. The pinstripes on the legs could probably stand to be a little straighter, but they look decent enough. Joker was actually pretty well accessorized. 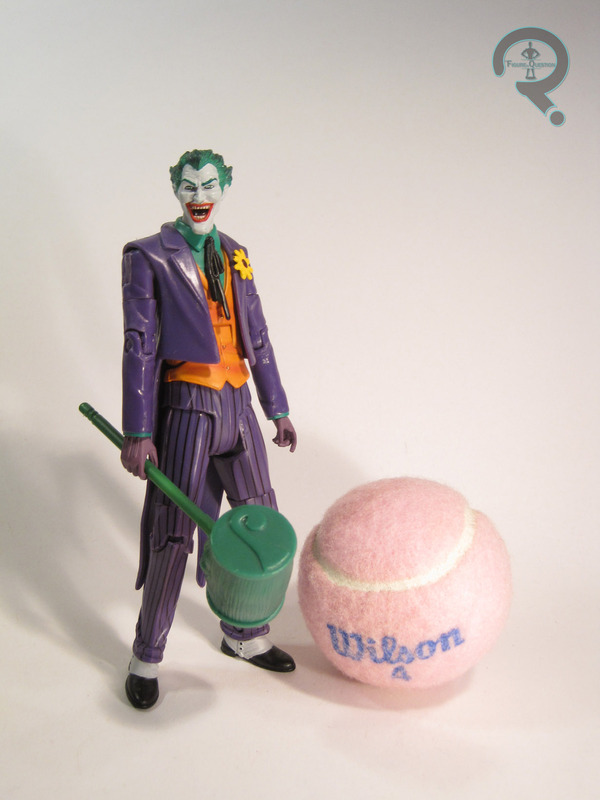 He includes a joker-head cane, some playing card, a laughing fish, and a large green mallet (deliberately pattered after the one included with the Super Powers figure). They were all pretty solid extras, among the best in the line. He also included the right leg of Imperiex, the Series’ CnC. Joker came from the same assortment of trips to Walmart with my Dad that netted me the previously reviewed Beast Boy. I don’t recall the exact circumstances, but he was definitely a later find, since he was the most sought after initially. He’s not one of my favorite DCUC figures, but that’s hardly because he’s bad. He’s actually very well executed, apart from the slightly lackluster handling of the articulation. For me, he just suffered from being “yet another Joker” in a series full of brand-new characters, but I suppose I’m a bit counter to most fans in that respect.